It’s not deep – but it’s still unwanted! 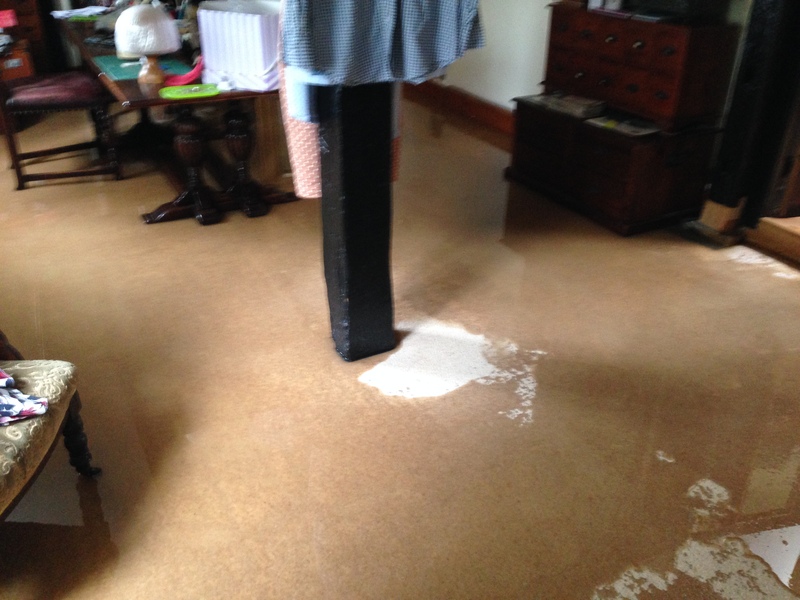 This week my plans were thrown into chaos when our house flooded. 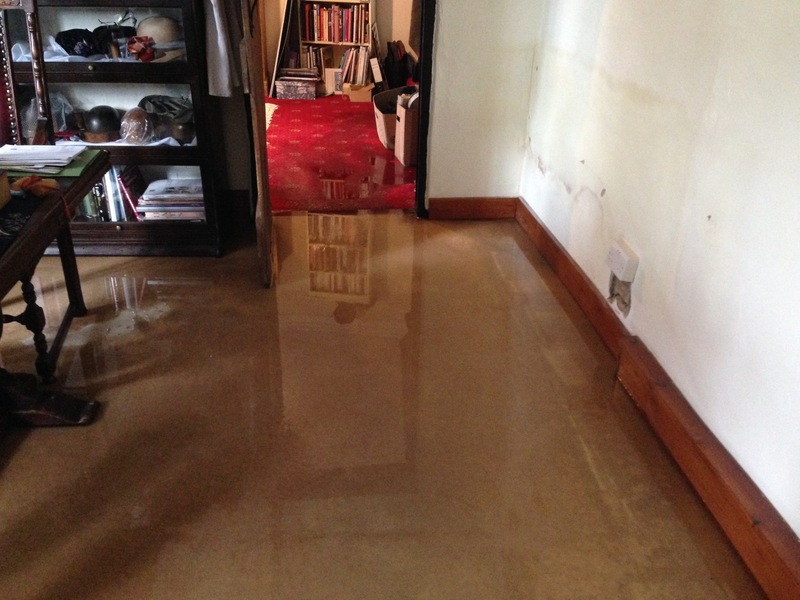 Before I go any further I should state that everyone is fine, no structural damage was done and we were about as lightly flooded as you can be whilst still being, well, in the situation of having dirty, contaminated water in your home. Let’s just say our garden pond partially relocated into our house but brought with it a strong hint of Septic Tank. I tweeted about it and my wife put some pictures up on Facebook and so people have been in touch to ask how things are. I don’t have a personal blog as well as this work-based one (and I treat this one as my personal blog anyway) so I’m putting some information and pictures up here. I won’t be mentioning Oracle or Office Politics. It’s just like a database performance issue – it is not so much the volume of data you process but the speed at which you need to process it. Your physical discs can only write so much data in a minute. If you try and process too much, it all goes wrong. After the rain stopped I went and checked the brook and garden – it was fine. 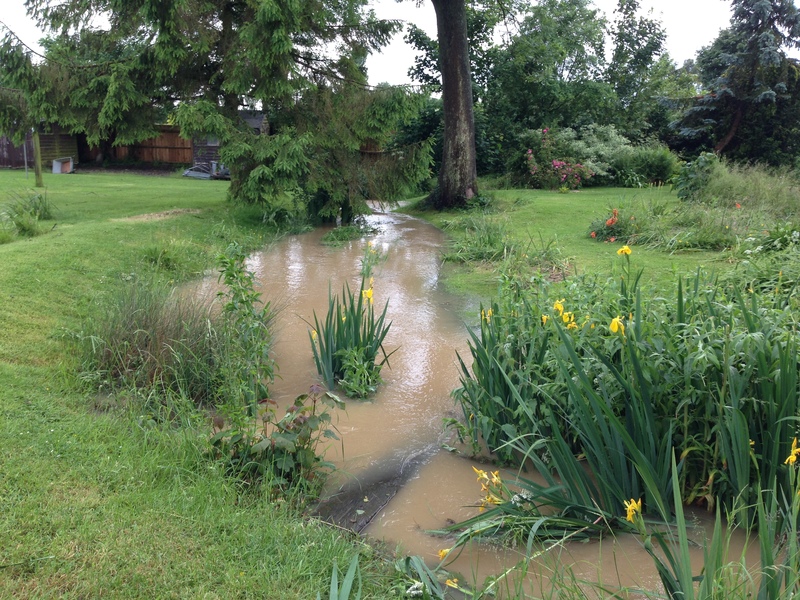 There was some standing water across much of the garden and it was flowing off into the brook and away. But then I saw one of the neighbours had a problem. There was water still flowing down the road and the brook on their side of the road was overflowing, it was threatening to get into their house. I went and got a spare sump pump I have but I could not find the attachment to put the pipe on it! By the time I had cobbled something together, the water was in their house. But the pump stopped it getting worse. Huzzah! What I had not noticed was that my brook had been rising fast. I went back to my house to find I had a stream flowing past my front door. I’d never seen that happen before… Oh crap. 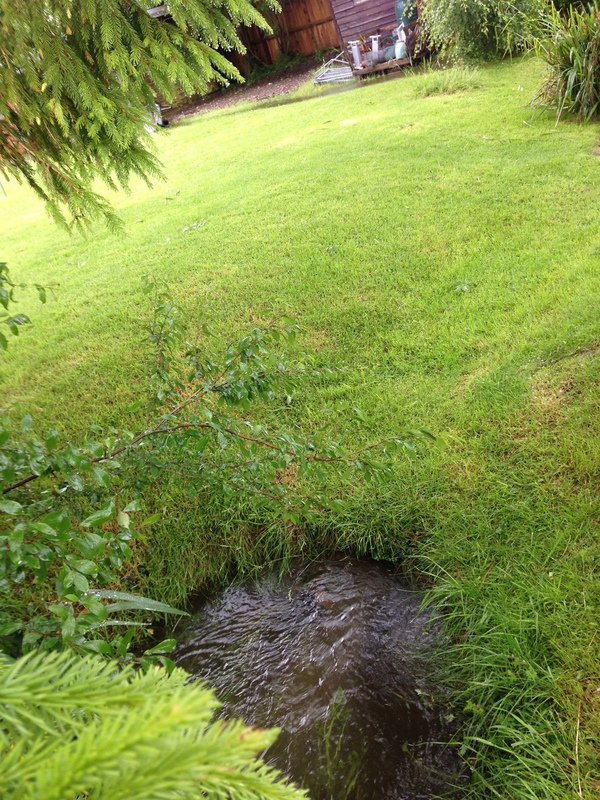 The brook had filled my pond and it had overflowed one small section, where another neighbour had reduced the bank height whilst building an extension. (No, not on purpose and neither of us had realised it might be an issue). 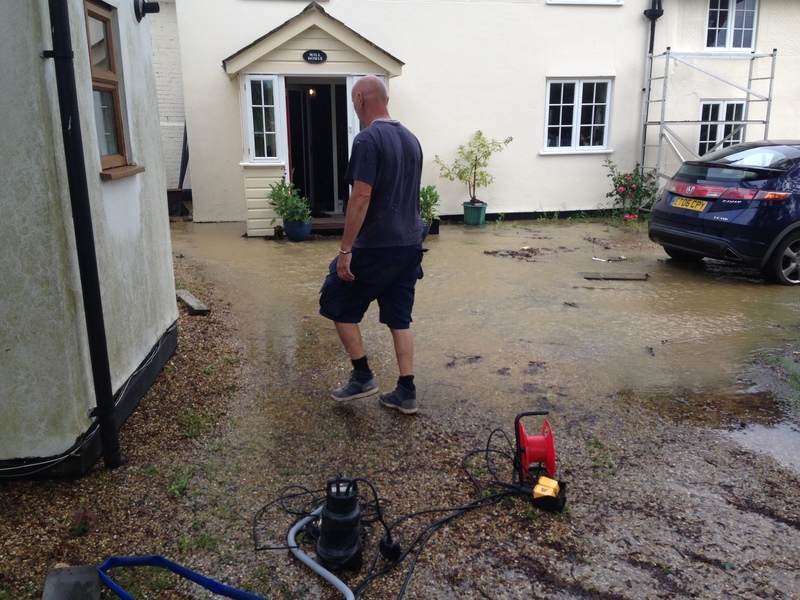 I went and got my pump (which was now redundant at the first house) but it can only shift about 5% of the volume going past the front of the house – It was not a raging torrent like you see on TV when major floods are reported, but it was a strong, steady, increasing volume of water that was creeping up the front of the house. Some spade work helped increase the flow and move the water on it’s way, I figured it would not breach the front door now. “She’ll nay take the strain, Capn!” Brook about to blow? I waded across the torrent (this was the point when the wellington boots become redundant as the water went past them and up to my knees) and checked the back garden, where the brook runs around the house. If it gets too high it normally overflows at one point and along a shallow depression which is there to take such unusual conditions. 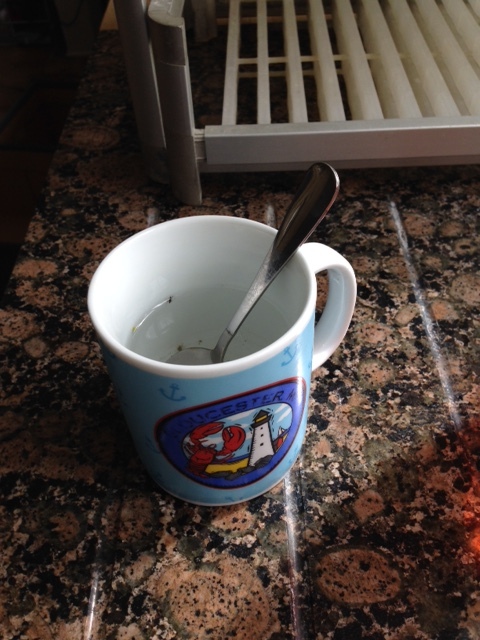 This was indeed happening – but such was the volume of water, there were pinch-points that have never been an issue before. The large tree you can see on the right is where that photo of the water going into a pipe is. Usually if the volume is too large for the pipe, it flows over the grass in a smooth way. Only this time it had a couple of “rapids” and was backing up towards the pond… And then the pond overflowed along several meters at once and I stopped taking pictures! The first trickle of doom? 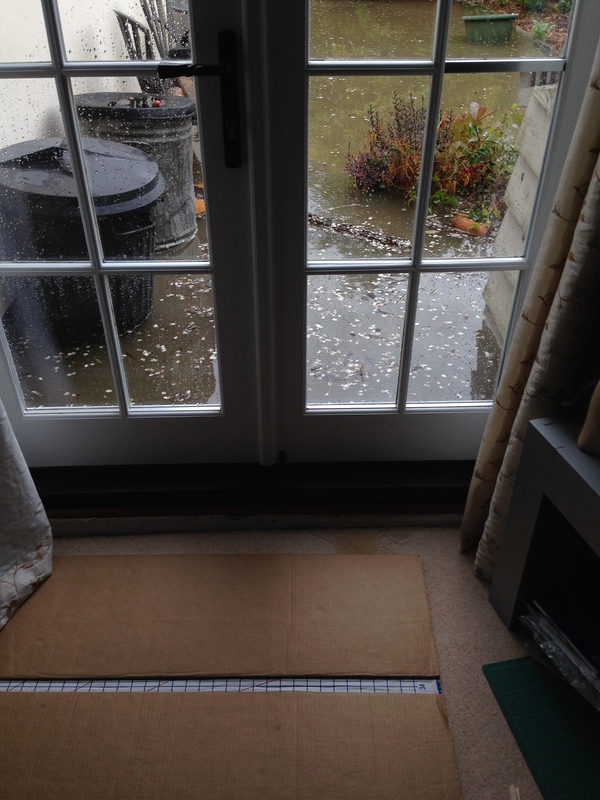 I checked next door and they had already flooded from the front (their house is lower than ours), with about 6 inches in the house. Would they mind if I increased the flow from our back garden to theirs, to try and stop us suffering the same fate? They graciously agreed to this so I set too with a spade and dug a drainage channel. It worked! Hundreds of gallons rushed away and the water level by those doors dropped below the threshold. Huzzah, let’s crack open the wine! Only, why is there a large puddle growing at the other end of the lounge? In the centre of the house? Parts of the house are old, some bits of it go back around 300 years. We have internal walls that were once external walls. The water was coming up through the floor at one of these junctions, it was somehow getting under the house and in through this gap. Game over, I had defended the perimeters but been taken by a sneak attack from below.